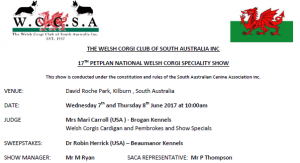 The Welsh Corgi Club of South Australia is holding the 17th National Welsh Corgi Speciality Show sponsored by Petplan on Wednesday 7th and Thursday 8th June, 2017. The venue is David Roche Park, Kilburn , South Australia. The judges are Mrs Mari Carroll (USA – Brogan Kennels) for the National, with Dr Robin Herrick (USA – Beaumanor Kennels) judging Sweepstakes. Entries close Friday 12th May, 2017. Further details are contained in the schedule [PDF].